The M60 3G SMS Alarm Dialler is an advanced Alarm Dialler, designed primarily for commercial and industrial applications. The M60 3G SMS Alarm Dialler comes with 4,8,16 or 56 individual inputs. Each input can have its own dedicated alarm message, so instead of receiving an SMS saying “channel 4 alarm” you can setup a more useful “High Temperature in Room B” message. When the M60 detects an Alarm it will automatically send an SMS over the 3G mobile/Cell phone network to your list of recipients. The M60 can accept any normal mobile/cell phone SIM card, this is easily fitted in a couple of minutes. Below is just a small selection of the features that are available, for the full list please visit our Standard Features and Optional Features pages or Contact Us. GSM Phone line Connection either dedicated line or as a backup option. Integrated 24hr plus battery backup. Remote Integration – you can phone the unit at any time to check its status. Fully Menu and keypad driven. Designed and built for industrial and commercial environments. Because the M60 is designed and built by us in the UK, we can customise the unit for your exact needs and situation including creating bespoke features and functions. For more information, help or pricing please contact us or visit our standard features or Auto dialer FAQs pages. The M60 Alarm Dialler is designed with multiple failsafes inbuilt or available as optional extras to protect critical systems such as Server Rooms, Green Houses, Livestock Enclosures, Freezers, Fridges and Environmental controls. One of the most popular failsafes is the Phone Line Backup facility, the M60 constantly monitors the connected phone line, if it fails it will automatically switch to the mobile\cell phone network. The Mobile\cell phone network can also be used as the default option if no landline is available. There is also the option for local alarms e.g. strobes/sirens to be triggered. The M60 is a dedicated Alarm Phone Dialer specifically designed for industrial/commercial environments. The M60 can connect to both the land line phone network and also the Mobile/Cell phone networks to send speech messages and or SMS messages. It is easy to connect either NO/NC or analogue Temperature Monitoring devices such as alarm thermostats. The M60 allows you to connect up to 56 individually identifiable devices. The M60 is used across multiple industries for Temperature monitoring including Server Rooms, Green Houses, Livestock Enclosures, Fridges, Freezers and Environmental control. The M60 3G Alarm Dialler is an advanced Alarm Dialler designed primarily for use in critical commercial situations such as Livestock Protection, Power Failures, Environmental Protection, Freezer Temperature Monitoring, Server Rooms and Lone Worker Protection. Our 3G Alarm Dialler has the facility to send both SMS and or Voice alarm messages to your preprogramed alarm contacts. Each input has its own dedicated SMS and Voice message that is user customisable, this makes alarm identification easy so instead of getting a generic “Channel 1 alarm” you would get “High temperature in server room H”. You can fit both contract and pay as you go full size 3G sim cards. 3G Phone line Connection either dedicated line or as a backup option. The M60 Alarm dialer is a commercial Alarm Dialer designed for critical applications. The M60 has the facility to monitor a connected PSTN land line, if that land line fails it will automatically switch to the Mobile phone GSM network. The M60 also has the optional ability to send SMS messages. This can be used as a secondary backup device as you can fit a second SIM card from a different network. I.e. you can send voice messages across network A and SMS across network B. Meaning even if one network is busy you can still use the other network to send your alarm message. The M60 can also be connected just to the GSM network if no PSTN line is available. The M60 GSM Alarm Dialler can send voice and text messages over the GSM mobile network and can also send voice messages over a connected PSTN land line connection. 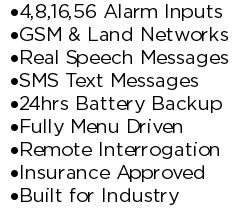 The M60 allows each input (4, 8, 16, 32 or 56) to have its own individual speech message or text message; these are user customisable to allow you easily identify a triggered alarm. The M60 GSM Alarm Dialler was designed with over 60 years of previous Alarm Dialler experience for use in commercial/business environments and includes features such as multiple dial out groups, integrated battery backup and being fully menu and keypad driven. The M60 Alarm Speech Dialler is designed for monitoring critical systems such as high/low temperature, mains failure, intruder alarms, environmental systems, process failures & life support systems etc. Each M60 can come with 4,8,16,32 or 56 individual NO/NC alarm inputs, each input has its own user recordable Speech Message. The M60 Alarm Speech Dialler allows you to easily customise your alarm messages meaning you are not stuck with a Standard “Channel 1” or “Channel 2” alarm message, you can change it to a much more useful “High temperature in Building A”. Recording speech messages is done simply via the menu system. When an alarm occurs the M60 will send the Speech message to your alarm contact list over either a standard PSTN line or over the GSM mobile network. 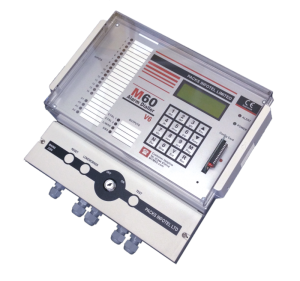 The M60 GSM Alarm System is designed and manufactured in the UK primarily for use in critical commercial & industrial applications, but also for large domestic premises. The M60 allows you to connect multiple individual alarm inputs, each with their own dedicated speech and or SMS message. When an alarm occurs the M60 will phone or text the people in the current callout list, the M60 will continue to do this until the alarm has been acknowledged by someone. The M60 comes with various backup options including; Line sensing, PSTN to GSM fall back, multiple contact lists and 24-48 hour battery backup. We have been designing and manufacturing GSM Alarm Systems in the UK since 1958, so we can customise the operation of the system to your exact requirements. M60 Alarm Dialer 2:54 pm on April 6, 2018	M60 owner’s portal launched! The Portal is free to use for both our current and prospective customers, it is designed to help you use and get the most from your machine. How to insert your SIM card. Change your outgoing alarm numbers. Check out the currently available software add-ons. Check out currently the available hardware add-ons. Links to the M60 Facebook & twitter feeds. Click here to visit the M60 portal. If you would like more information on our new M60 or our current price list then please Contact Us Today. M60 Alarm Dialer 12:34 pm on July 6, 2017	The M60 Alarm Dialler Has Just Been Released! The M60 Alarm Dialler has just been released! This is a direct replacement for our popular M30 “Ultimate” Alarm Dialler that has been in production since the early 2000’s. The M60 is now the 10th different model of Alarm Diallers we have produced since our company’s inception in 1958. The M60 was created to give our customers the most advanced & modern Alarm Dialler system possible. We asked our customers what they would like to see on our next version and we have done our best to integrate the requested new features or offer them as optional extras. The M60 now stores its numbers in its permanent storage, so it will not lose them even if the power is removed for years at a time. The M60 now comes with a screen printed termination plate to allow reset and test buttons to be easily fitted either as standard or as a retro fit by a customer. The M60 now gives the option to send SMS alarm text messages on top of or instead of standard voice communication. The M60 now offers a full time mobile/cell phone connection if there is no land line present or the M60 can automatically swap over to it as backup facility if the landline fails. The M60 now allows you to have an integrated Lone Worker system. The M60 Lone Worker once activated requires a lone worker to press a local or remote button every x seconds, if they fail to do so it will issue a warning and then send an alert out to the on call personal. The integrated switched outputs can be set up to turn items on or off during certain occurrences or remotely via the phone line. With the M60 each individual input/channel can have its own dedicated list of alarm contact numbers. This means that for example channel 1 could phone the fire brigade and channel 2 could phone the on call engineer. The M60 can have up to 4 Analogue signals connected; this can also be used with data logging. The Timed Roster option allows you to automatically switch between your rosters at certain times of the day/week. E.g. you might have a Day Roster, Night Roster and Weekend Roster. The M60’s LIM board will have an integrated filter fitted so you can easily have ADSL or fibre on the same phone line without any interference.